A growing body of research is revealing what artists have long known. There is healing in art. As more research is conducted more will be known. Medical and nursing schools are beginning to incorporate more arts in curriculum. Even though artists know of the healing potential of art, do galleries and museums know? Two studies, (Lazarus 2003, Riis 2000), have shown the potential for art to lead to a better understanding in medical students of the human condition by helping the students relate to various emotions depicted in art. Students visit a museum and are encouraged to examine the emotion portrayed in the art and compare to situations encountered in medicine. The results have revealed the students gain a greater expression of empathy. In the second study, the authors conclude, “ …the humanities and the arts offer approaches and inspiration that are of the greatest value to the education of doctors of all levels, (Tidsskr 2000). I have seen this aspect of art in my own work and wonder why the concept of art’s healing potential has not yet gained wider recognition. It is a slow process and takes time. Or that “science versus art” thing remains a major barrier. Hopefully, the barrier will continue to come down and art will become a more widely utilized tool for the medical profession, in galleries and in hospitals. Kathe Kollwitz was a master at depicting human emotion. 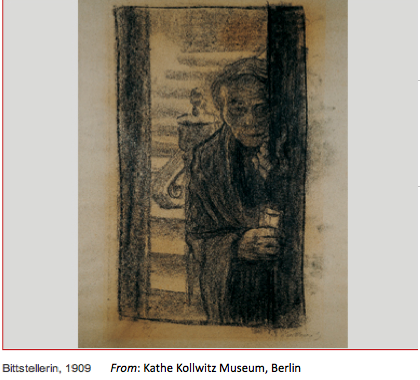 Visit the Kollwitz Museum website for more on her work. This entry was posted in art, Uncategorized and tagged Alain de Botton, Art, Art museum, Education, Kathe Kollwitz, Medical school, Medicine, Museum, Visual Arts. Bookmark the permalink. Thank you! I will continue to enjoy following yours! !